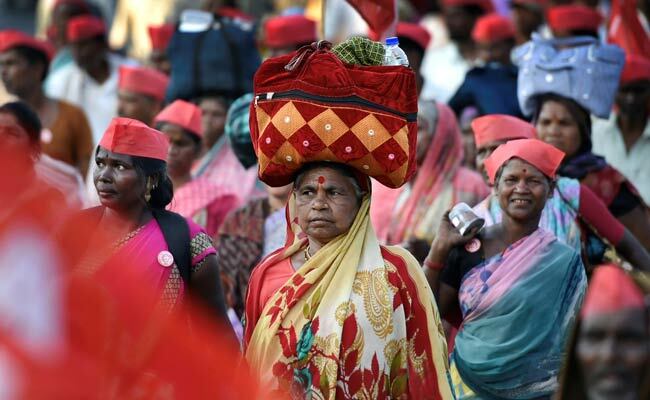 The number of farmers and tribals in the march to Mumbai swelled to 50,000 over the last two days, the All India Kisan Sabha said. 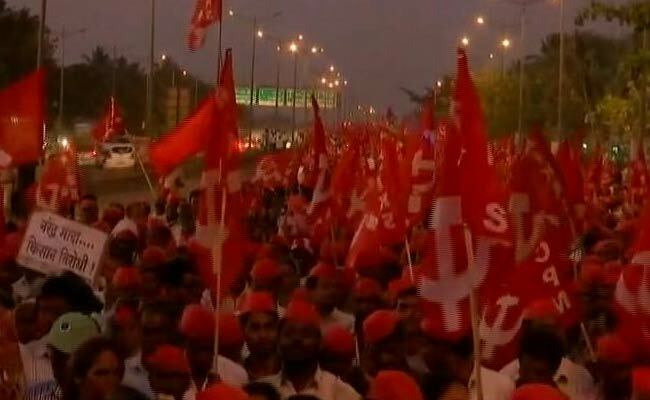 After walking with blistered feet for about 180 km in the blazing sun over the last six days, thousands of farmers from Maharashtra's Nashik district entered Mumbai on Sunday, turning the arterial roads of India's financial capital into a sea of red. Their numbers swelled from 35,000 to 50,000 over the day, the organisers said. Today, they plan to surround the state assembly to press for their demands of a complete loan waiver, fair pay and transfer of adivasi land to farmers who have been tilling it for years. The tribals have joined the protest in huge numbers. The huge crowd reached Azad Maidan around 5 am. The protestors had camped at the KJ Somaiya Ground before marching towards Azad Maidan, a large ground designated for protests in South Mumbai, shortly after midnight. Last evening, as the procession teemed into Mumbai, Girish Mahajan, senior minister in the cabinet of Devendra Fadnavis, welcomed the march at Mulund in suburban Mumbai. "We are sad that farmers have come all the way to protest," he said, adding that the government, which has met some earlier demands, will consider the fresh wish-list. The opposition Congress, Nationalist Congress Party, the Raj Thackeray-led Maharashtra Navnirman Sena and Shiv Sena, which is part of the ruling alliance, have extended support to the farmers' demands. Shiv Sena leader Aditya Thackeray met the farmers yesterday. But the farmers are not happy. They want the Sena to speak as representatives of the government and not as a political party. In November last year, the Devendra Fadnavis government had announced loan waiver for farmers after the state witnessed a 10-day long protest by farmers. Without mentioning figures or who would be eligible, he had promised that it would be the "biggest loan waiver in Maharashtra's history". Last month, state Governor Vidyasagar Rao told the state assembly that said the government has transferred more than Rs 12,000 crore into bank accounts of more than 31 lakh farmers. But the farmers also want the implementation of the Swaminathan Committee report, which says farmers should be paid one-and-a-half times the cost of production and the Minimum Support Price should be fixed keeping this in mind. The farmers, who had camped at the KJ Somaiya Ground in Sionas night fell on Sunday, began moving towards the Azad Maidan, about 15 km away, just after midnight. From there, they intend to proceed to the state assembly, another 2 km away, later in the day. Government sources said the protesters will not be allowed to proceed beyond Azad Maidan and a delegation will be allowed to come to the Vidhan Bhavan to meet the Chief Minister. 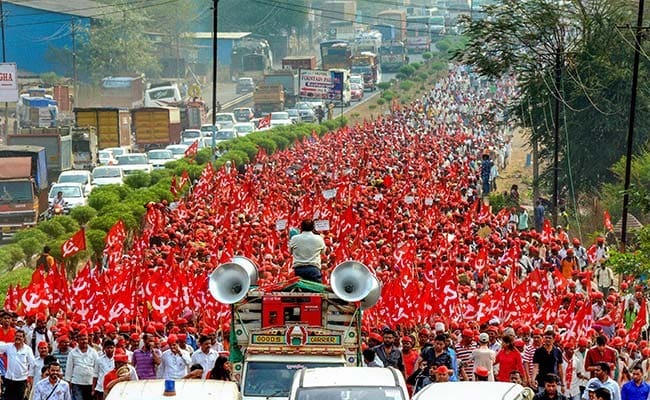 The farmers say the march to the assembly is on, but the Left-affiliated All India Kisan Sabha or AIKS, which is spearheading the protest, also say they are willing to consider what the government offers. Sunday's protests did not affect traffic in Mumbai, which last year was witness to the huge, silent demonstrations by Maratha groups. Refusing to comment on whether they would be allowed to march to the assembly building tomorrow, joint police commissioner Deven Bharti said, "Top ministers are speaking to them".